‘Bella Vista’ is a lovely 3 bedroom cottage, sleeping 6, built around 200 years ago. It has all the facilities needed for a comfortable stay and is ideally positioned near the Suffolk Heritage coast, ideal for visiting Southwold, Aldeburgh, Dunwich, Walberswick, Framlingham and the surrounding area. Bella Vista is an ideal property from which to explore the beautiful Suffolk countryside and coastal areas including Minsmere. Weekend and short stay breaks are available throughout the year. Preferred change over day for weekly lets is Friday, we will make an exception for bookings off peak times and longer weekends. My name is Erika, I am Peruvian but have lived in England for the last 25 years. My husband and I have owned Bella Vista for more than 10 years and we have been letting the cottage as a holiday home for many years. Our holiday cottage, Bella Vista, is a home from home, perfectly suitable for a family (we do stay ourselves on a regular basis), with all the facilities that we think you'll need for a comfortable stay. We have a extensive library from which you can borrow books and return later if possible, we love the beach at Southwold and like the relaxed feel of Suffolk. We are a family that loves travelling and enjoy exploring the many places near Bella Vista, we hope you enjoy your visit and record your adventures in our guest book. Bella Vista is unique and perfectly located for visiting the local attractions. Located in front of the village cricket ground and with a view of the church from our shutters in the enclosed patio, you can enjoy the cottage inside and out. Downstairs family bathroom: shower bath with shower, basin and toilet. Upstairs WC, with toilet and basin. Plenty of parking on street, the property has not got a parking space. Lounge with stripped floorboards, sofas, chair, coffee table, widescreen TV, DVD, monks bench, Welsh dresser. Snug/library room: Seating, rocking chair, working open fireplace, library and understairs cupboard. Table with seating for 6/7, fan oven, gas hob, microwave, fridge with Icebox, washing machine, CD/radio, food cupboard and Welsh dresser. There are many golf courses nearby, please contact owners. Notes on accommodation: There is a living fuel effect gas fire in the sitting room available for use that takes the chill off an Autumn morning/Evening without resorting to the central heating. There is a travel cot in the third bedroom. No pets. This is a non-smoking property. Outside: Good size landscaped front garden, which is mostly limestone paved with attractive flower and shrub borders and is bounded by a brick wall with wrought iron entrance gate. To the rear is an enclosed Mediterranean style tiled courtyard garden with high walls and wooden window shutters that open to views of the back of the church. Utility Room: Shed with BBQ for summer, parasol and beach equipment that can be borrowed, light for night time sitting in the courtyard garden. Cleaning / Towels / Linen / Maid service: The property is rented with linen, towels and cleaning services on departure included in the price. If a 2 week or longer stay is booked interim cleaning and linen can be arrange at an extra cost. Other: Landscaped front garden with benches. Mediterranean rear courtyard patio with table and chairs with window shutters overlooking churchyard. Storage shed. A great house in a fantastic location. A lovely property in a great location, away from the busy streets of Aldeburgh and Southwold but close enough to visit. The house had everything we needed for our stay, we wished we could have stayed longer. We hope to welcome you again and we are glad you and your friends enjoyed your stay. Bella Vista was everything we needed for our family holiday and communications before and during our stay with our host Erika were prompt and helpful. Facilities in the cottage are perfect for relaxing after a day out or for a slow start, with a nice size well equipped kitchen / dinner and sitting room. The cottage is great base for exploring the locale and we had fun visiting Framingham castle, Rendlesham forrest, Sutton Hoo and the Suffolk beaches with plenty of crabbing thrown in. Quaint cottage in a lovely little village. 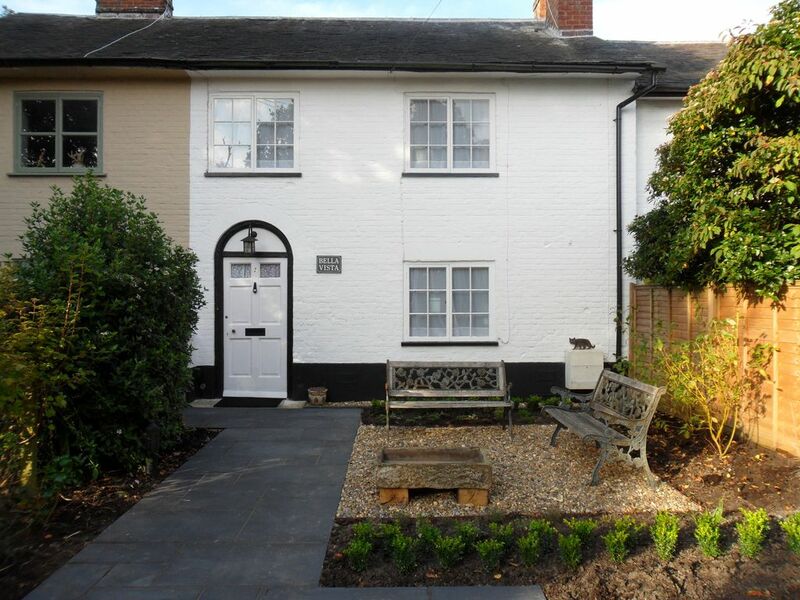 A delightful cottage set in the village of Yoxford. Quirky layout but a perfect retreat for a relaxing couple of days away. Well positioned to access Snape, Southwold and Aldeburgh. We had everything we needed in the cottage, thank you Erika it was very relaxing. Thank you Sarah, we are glad to hear you had a nice couple of days and we hope to welcome you again. Positives: OK location for Southwold and Alderburgh beaches. Price slightly lower than other properties on homeaway website. Negatives: House generally felt very neglected. Fusty and smelly inside. Didn't feel very clean - especially in the kitchen. Needs coat of paint. Hundreds of ants all around front door, including a lot of flying ants that managed to get into the living room when we opened the front door. Could hear the neighbour going upstairs at night and getting into bed. Didn't like the fact the house backs onto a very dilapidated graveyard. Backyard very run down and very old, shabby garden furniture - we didn't want to sit there and eat. Benches in front garden completely covered in bird pooh, so we couldn't sit on those. Kitchen on arrival – Apologies for this, we’ll mention this to the cleaner and see if there was any reason it was not up to the usual high standards that we normally see. Coat of paint - The house has been incredibly busy this last 12 months and agree it could do with a lick of paint in some places – in fact we do have a painter booked for the winter when the bookings quieten down. Backyard garden furniture – fair point, the winter takes its toll and so will be replaced asap, however nearly every other guest has made, and continues to make, good use of the patio and the furniture as is (it is lovely for breakfast BTW – a real sun trap). So overall a couple of valid points, but 1* is a bit harsh IMHO for minor issues and should be read in context with all the other 5* reviews. Perfect base for a birding holiday. Really nice place to stay. Quirky and has everything you need, and the beds were really comfortable. We used it as a base for a birding and photography short break - 80 year old Dad and two sons in their 50's, and it accommodated us all very comfortably. Plenty of places to eat around and about too. A charming cottage with great facilities! Very enjoyable! The Suffolk countryside and coastal area is a great location for cycling. We have a map of local routes to enjoy during your stay. Very close to Minsmere for bird watching. The closest beach is Dunwich, approximately 10 minutes by car. The rest of the beautiful Heritage coastal beaches, Southwold, Aldeburgh, Walberswick are all about 15 mins drive. Yoxford is easy to reach by car, lying just off the A12. Cambridge is 67 miles, 90 minutes away. London is 100 miles, approx 2 hours away. Peterborough 100 miles, approx 2 hours away. The train station at Darsham is about 1.5 miles away. Leiston - Co-op (6 miles). Saxmundham - Waitrose and Tescos(4 miles). Pakefield - Morrisons (17 miles). Martelsham - Tesco (18 miles).